In a contest organized by the Intermediate Division Student Council, fourth and fifth grade students were asked to design a poster carrying the message that it is important to speak positively and use appropriate language. Posters used slogans like “Don’t swear. Care” and “Better Words Create a Better World.” to get the message across. 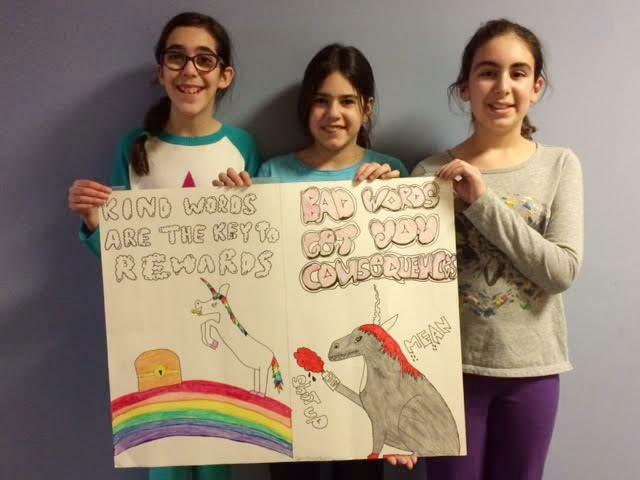 Mazal tov to contest winners, fifth graders, Yael Margolis, Eliana Lippman and Eden Cherubino on their poster with the slogan “Kind words are the key to rewards. Bad words get you consequences.” All of the posters entered in the contest are currently on display in the first floor hallways of the Shoolman Campus. Come check them out!